Abscesses, sometimes known as Boils or Furuncles, are areas where an infection has caused an accumulation of pus. Pus is the debris left over from your body’s attempt to eliminate an infection; it consists of white and red blood cells, live and dead bacteria, and inflammatory fluid. The most common bacterial culprits are Staphylococcus Aureus and Streptococcus Pyogenes. These organisms are thought to occur naturally on the skin of ¼ of the general population. The tendency to boils may be related to issues with hygiene or a foreign body lodged under the skin, but could just as easily be hereditary in nature. I know a number of families in which multiple members suffer from this condition. Other risk factors include Diabetes, chronic skin conditions, weakened immune systems (like those on dialysis), and intravenous drug use. Those prone to abscesses may benefit by regularly cleansing with Chlorhexidine (Hibiclens) or other antibacterial soaps. Abscesses may form anywhere that there is an infection. They can be found in deep organs, such as an inflamed appendix, in the breasts of new mothers, or in areas of diseased gums and teeth. The most common location, however, is just below the skin, most commonly in the armpits, groin, thighs, buttocks, and face (severe acne). The average person has many glands and hair follicles that can become blocked and infected. Although microscopic, these infected glands can give rise to abscesses the size of baseballs. Once they reach a certain size, significant pain due to pressure and inflammation is likely. This is especially true around the area of the buttocks. The body’s immune response has a tendency to wall off infections. This effort by your immune system to isolate the infection is praiseworthy, but the walls of the abscess make it difficult for antibiotics to penetrate inside and kill the remaining organisms. In these cases, modern medical care must be accessed to eliminate the problem. But what if the aftermath of a catastrophe leaves you without this option? You might have to intervene by performing a procedure we call “Incision and Drainage”. Before you resort to this sort of intervention, make every effort to use non-invasive techniques. The most successful of these would be the application of moist warm compresses to the abscess. This should be performed several times a day for at least 20 minutes each time. Over time, the boil should “ripen” and come to a white or yellow “head”. With any luck, it will then drain on its own. This can take a week in some circumstances, but the compresses should speed the process considerably. Don’t forget to wash the area frequently with an antiseptic cleanser, such as Chlorhexidine (Hibiclens). Some use Witch Hazel for this purpose. First, wash your hands with soap and water and put on your gloves. Place ice on the head of the abscess and wait a short time for some numbness to occur. Then, apply your antiseptic (Betadine, alcohol, etc) over the area to be incised or “lanced”. Isolate the area with drapes or towels. If your scalpel or other instrument isn’t sterile, place it under a fire until it turns red. Let it cool off. Have some gauze ready to catch the pus as it drains; it is filled with bacteria, and you don’t want to spread the infection. Dispose of the gauze immediately afterward. 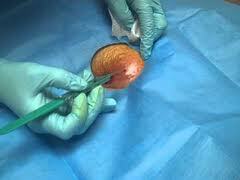 Then, using the tip of your scalpel, pierce the skin over head of the abscess, where it is softest (this will hurt). The bigger the opening, the more easily the boil will drain. The pus should drain freely, and your patient will probably experience immediate relief. Although some question its effectiveness, apply some triple antibiotic ointment to the skin surrounding the incision and cover with a clean bandage. Clean the site and change the dressing frequently. Alternative to antibiotic ointments include Lavender Oil, Tea Tree Oil or even raw unprocessed honey. If you have oral antibiotics available, begin a course of Clindamycin (300mg three times a day x 7 days for adults – available in veterinary equivalents). 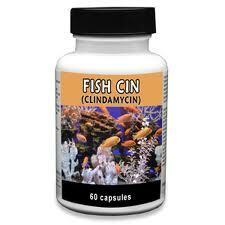 Clindamycin is acceptable for those allergic to Penicillin. Very large boils, once incised and drained, are sometimes kept open so as to allow continuous drainage. Often, a wick made of thin gauze with dilute Iodine solution (“Iodoform”) is inserted to kept normal immune response from closing the abscess wall. This insertion requires some practice, so reserve this technique only for the worst cases.